TORONTO, Ontario, Canada, March 12, 2010 (ENS) – The Ontario Power Authority has approved payment contracts to 510 new green energy generating projects, most of them solar power installations. 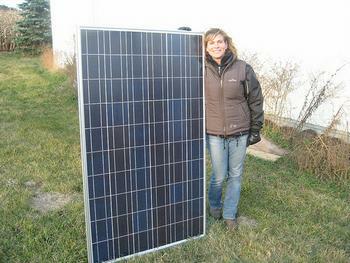 Under Ontario’s new Feed-In Tariff program, the most comprehensive of its kind in North America, participants are paid a fixed price for the electricity they generate. The 510 projects are to be built in 120 communities across Ontario by farmers, municipalities, local distribution companies, commercial businesses, industrial facilities, schools and hospitals, a winery and a church, OPA officials announced Thursday. These 510 projects, ranging from 10 kilowatts to 500 kilowatts, are the first larger power generators to obtain contracts through the Feed-In Tariff, FIT, program. Smaller projects were approved in December. The first 700 smaller microFIT project contracts were issued on December 16, 2009. The FIT program supports Ontario’s commitment to eliminate coal-fired power generation by the end of 2014 – the single largest climate change initiative in Canada. FIT and other initiatives under the Green Energy Act, passed last year, will support the creation of 50,000 green collar jobs, say provincial officials. Prices paid for renewable energy generation vary by energy source and take into account the capital investment required to get a project up and running. Lanfill gas generation pays the least at 10.3 cents per kilowatt hour and solar photovoltaic power pays the most at from 44.3 to 80.2 cents per kilowatt hour. FIT and microFIT contracts are for 20 years, with the exception of waterpower, which has a 40-year contract. A new rule provides that developers must meet a certain percentage of made-in-Ontario goods and labor at the time their FIT project reaches commercial operation. For solar photovoltaic projects larger than 10 kilowatts, the requirement is 50 percent today and 60 percent on January 1, 2011. “With our new domestic content rules, these projects will also help create new green collar jobs here in Ontario, as well as major economic investments in equipment and services here at home,” Duguid said. The 510 projects have a total generating capacity of 112 megawatts, enough energy to power more than 13,000 homes. Loblaw Companies Limited, Canada’s largest grocery retailer, has been approved for FIT applications for rooftop solar installations on 136 of its Ontario stores. The grocery retailer will initially launch four pilot projects in select stores across the province and then evaluate the next phase of rollouts. 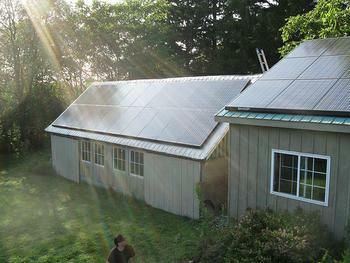 The FIT program already has generated business for solar installers and property owners. Owners who have at least 40,000 square feet of usable rooftop space can lease that rooftop to a solar systems supplier for a yearly fee on a 20 year contract. They have a source of annual income and reduce operating expenses such as air conditioning. The Ontario Power Authority began accepting FIT applications on October 1, 2009 and received 956 eligible applications for the first round of FIT contracts, including the 510 projects announced Thursday. Because each of these projects is less than 500 kilowatts, they can be connected to Ontario’s electricity grid without detailed impact assessments necessary for larger projects. As of March 8, more than 180 microFIT projects had been connected to the grid and will be receiving payments for the electricity generated. As of the fourth quarter 2009, the OPA had 13,409 megawatts of electricity supply capacity under contract. This includes 3,709 MW of renewable energy, 6,700 MW of clean energy, and 3,000 MW of nuclear energy.